Join us on Facebook for OFFICIAL RecruitParents.com Boot Camp Groups by Graduation Date. We just received our first order from the EGA Shop. We now have the 2016 Marine Calendar and most importantly the Parris Island Recruit Training Matrix. Just having some idea of what our son will be doing everyday during bootcamp is making his departure on Monday a little easier. 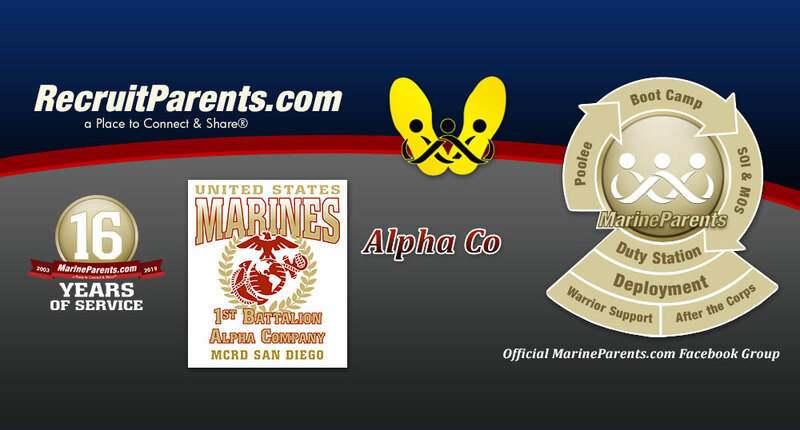 We greatly appreciate Recruit Parents and Marine Parents for being there for us. I just wanted to say this group has been a life saver for me. The support and the guidance that I have received here is unbelievable. Thank you everyone for volunteering and helping us going through this season of our recruits' and our own lives. Blessings to all. Lisa (3rd Bn, Co Leader, Lima Co, SD), you are a God Send!! Thank you so much for all you do...You make my life more bearable with so much inspiration! I thought it was hard when my 2 other sons left for the air force. This is by far harder since he is my baby and we are now "Empty Nesters". Thank you for making our journey a little easier! Renee (2nd Bn, Co Leader, Fox Co, SD), over the past couple of weeks I (we) have become Facebook addicts due to the vast amount of info that you and the admins of Fox Co. have been providing for us. We are able to better visualize what our son is experience and have more specific prayers bombarding heaven for him and his recruit brothers. The words 'thank you' don't even begin to cover our deep feelings of gratitude. Grateful for you Karen (4th Bn Leader), you are so good at this! Every time I read something you've written I feel soothed and more relaxed. So glad to finally hug my boy after 17 (yes due to fortunately a minor injury) grueling weeks. Your daily inspiring and detailed information has helped to get through each day. I will miss your daily support. Thank you thank you thank you!!! Kim (3rd Bn, Co Leader, Kilo Co, PI), we would have been lost without you!! I feel that being part of this group really gives us a peace of mind. Thank you for all you do! Here's a great big shout out to Teresita Reynolds (Director of Facebook Groups) for being our fearless leader in this group! THank you for all the time and wisdom you invest in to us. Thank you for answering the same questions over and over as people join, and always answering as if it were the first time you've been asked. You fill in the gaps and encourage us when we need it. We appreciate you! I'm having a hard time saying goodbye to this group. It has been so amazing and helped me through my son's transition from recruit to Marine. Thanks everyone! Especially Marci Thompson! All you moms just starting this journey know that you have found the right group to help you. Semper Fi! Thank you, Teresita Reynolds. I feel like you have held my hand through this journey and I would have been lost with out all of your guidance. I loved all of the daily posts that let me know what their schedule was for the day; it made me feel so much closer to my son. And every time I had a question or a concern, you were there with answers and comfort. So, I just wanted to say thank you - I really appreciate you!! Scarlet, my wife and I would like to thank you and the others who helped out for being the Golf Co. FRG Facebook leaders while the boys were in boot camp. You did a great job! Thank You. I swear I would not survive this without you and these posts. It is like you are in my head, knowing what I am thinking, and then telling me what to do. My gratitude for you is huge. Thank you a million times over!!! Thank you for everything. I am forever thankful. You have truly become a blessing. My heart is breaking a bit because I just met a family who's son is about to graduation recruit training and they never knew about the resources available to them, and have not had any support through this journey. 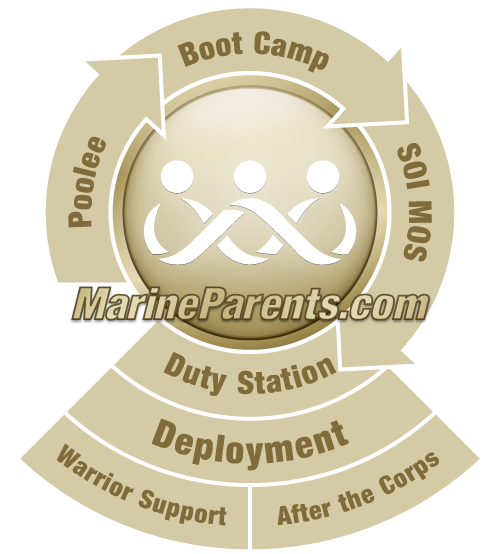 This is a great FB page to gather information when you have a Poolee, hoever MarineParents also provides individual FB groups once your recruit ships. You will not only get up to date information on what your recruit is going through that week, but you'll also meet some amazing people and gain life long friends! Thank you again Kimberly Rumph, your words and wisdom make a difference in each of us everyday, I'm speaking for myself...but im sure others whole heartedly agree!! As we sit in front of the theater waiting for our Marine, I just wanted to say thank you again for all who make this page possible, it's been such a blessing!! Honestly, you must have been meant to do what you do. You have a gift, and I hope you realize just how important and meaningful your words are...Your confidence in our children and the program gives us the strength we need when we feel so helpless and worried. May God bless you always.